Smile of the Buddha explores the influences of Asian world-views and particularly Buddhism on the art of Europe and America in the modern era. 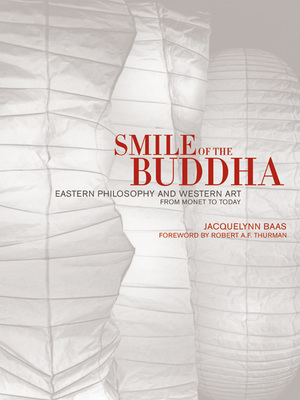 In an informative and perceptive introduction and essays on twenty well-known artists, Jacquelynn Baas analyzes how the teachings of the Buddha offered alternatives to Western intellectual conceptions of art and traces the various ways this inspiration materialized in artworks. The influence of Buddhism on art from the last quarter of the nineteenth century to the present has been greater than historians and critics generally recognize, Baas claims. Considering essential questions about the relationship of art and life, this timely and beautifully illustrated book expands our perspective on how spirituality and creativity inspire and inform one another. Baas's insights and the images she presents give the reader a new understanding and appreciation of a diverse array of Western artworks. Jacquelynn Baas is an independent scholar and Director Emeritus of the University of California Berkeley Art Museum and Pacific Film Archive. She is the coeditor of Buddha Mind in Contemporary Art (California, 2004) and coauthor of The Art of Joan Brown (California, 1998) and José Clemente Orozco in the United States 1927-1934 (2002). Robert A. F. Thurman is a prolific author and translator of both scholarly and popular works. He is the Jey Tsong Khapa Professor of Indo-Tibetan Buddhist Studies at Columbia University and Director of Tibet House in New York City.